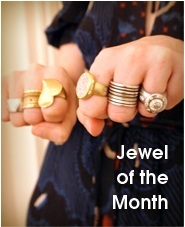 A big thank you to jewelry writer Amy Elliott, who gave me a shout-out in this Yahoo! News story on “mangagement” rings. I happen to be very proud of a gorgeous brown-diamond mangagement ring I made last year. There’s a twist though! Amy wasn’t talking about one of my men’s rings. Instead, she mentioned my more gender-neutral styles, which include the diamond-and-platinum “Gravity” band seen snuggling with the mangagement ring in the above photo. 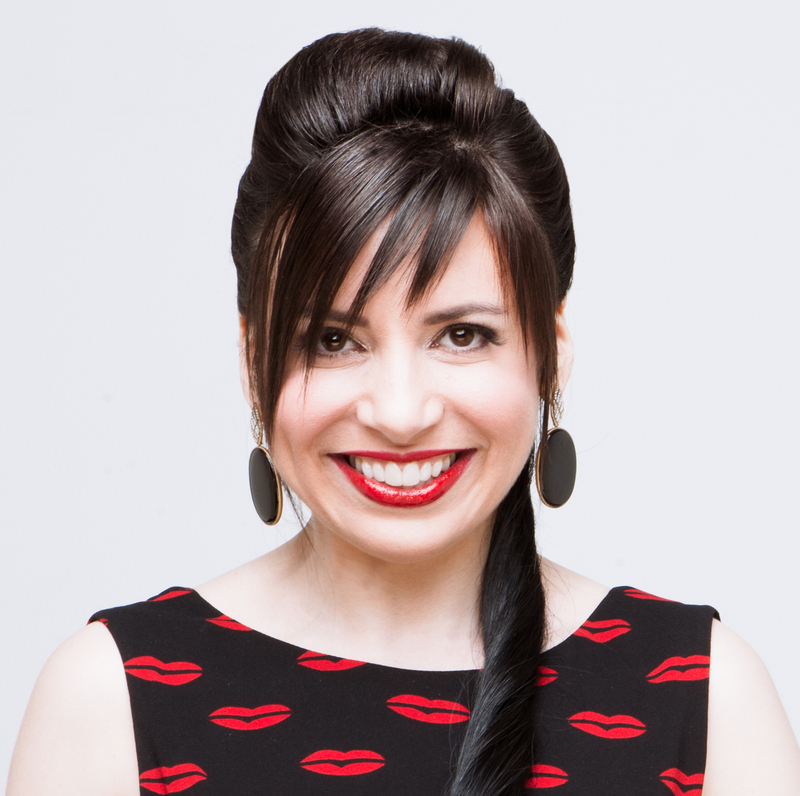 The timing is incredible, because yesterday I shared an interview I did with Severine Ferrari, the editor in chief of Engagement 101, in which I spoke about the platinum ring starting at 6:21. To be clear, most of the engagement/wedding jewelry I do is made to order, so I follow the customer’s vision. As a result, those rings may appear to you to be traditionally “feminine” or “masculine,” especially when you know the recipient’s name is Abigail. On the other hand (ha! 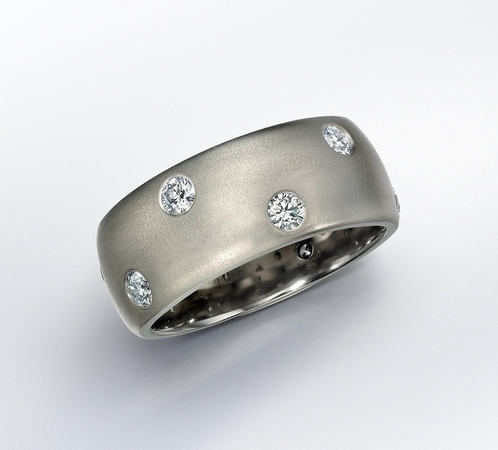 ), quite a few non-wedding rings I’ve made in a woman’s standard size 6 look fabulous on men. For example, my Borgia poison ring has been purchased as a man’s pinkie ring. Borgia poison ring. Click for more information. Why shouldn’t that apply to wedding jewelry? I believe that almost any of my engagement/wedding ring designs could be worn by a woman, man, or someone who identifies otherwise — once it’s sized for the wearer’s finger. It’s all about proportion! 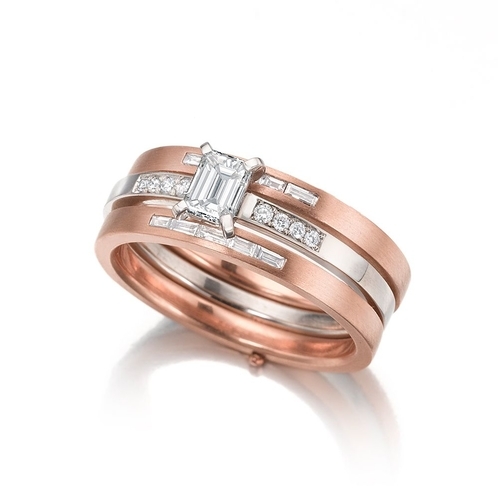 The brown-diamond mangagement ring? Anyone could wear that style as long as it was made the right size. You just have to think outside the box (ha! again). This engagement ring, made for Helen, would totally work as a man’s wedding band. That said, my Gravity ring styles were deliberately made to be gender-neutral, starting in 2010. That’s when I made a ring for a (female) friend that was meant to serve as both an engagement ring and a wedding band. It’s unisex: A man and a woman could have matching rings. It would also work for two women getting married, or two men. It’s ergonomic: The stones are set flush with the metal, or nearly so. You won’t get it snagged on anything, the way you might with a ring with a very high setting. It’s versatile: It doesn’t have to be worn as wedding jewelry at all. I often wear the gold-and-black-diamond Gravity ring on my right index finger and I have several gorgeous customers who also wear that version as a right-hand ring. 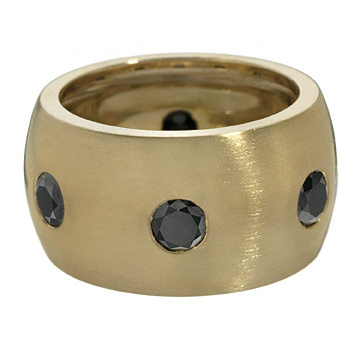 Gravity ring in 18K yellow gold and black diamonds. The style also gives you the opportunity to make “One ring to rule them all” Lord of the Rings references, so that’s an extra-special advantage. Not all of my Gravity styles are on my redesigned website quite yet, but they will be soon (like, within days, I swear). One thing you can see right now is that the name of my wedding-related collection is “Wendy Brandes Wedding,” not “Wendy Brandes Bridal.” I wanted to make it clear that I design for everyone — including brides in white dresses, but not only brides in white dresses! 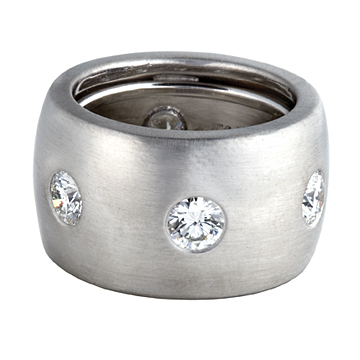 Gravity ring in platinum with diamonds. In fact, I have a great new style coming up that’s the opposite of traditional “bridal.” I ordered a pair of stones today because I’m going to do two identical rings, so a couple — any couple! — can have a perfectly matched and very unusual set. Stay tuned. Contact me at info at wendybrandes dot com to discuss purchasing or creating the engagement/wedding jewelry of your dreams. To learn more, you can also check out some of my previous blog posts for information about the process; my design philosophy; advice about metals and gems; and more examples of custom work. Finally, this video explains the difference between my fully custom pieces; limited-edition semi-mounts; and one-of-a-kind ready-made designs. 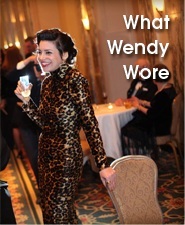 Again, send questions to me at info at wendybrandes dot com. I’m excited to work with you! « Wendy Brandes Wedding Jewelry on Engagement 101!